A new take on an old classic, Interstellar Invasion! is a modern day Space Invaders clone. 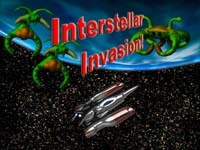 20 levels of frantic action ensue as you attempt to thwart yet another invasion from outer space!